Hot Bites | Rustic home cookin' with a modern twist! Rustic home cookin' with a modern twist! I have been on a bit of a health kick lately, but I refuse to completely give up red meat and, today, realizing it has been a while since I’ve had a good steak, I knew just where to go to get one… Trust me I know this may surprise you… Target! 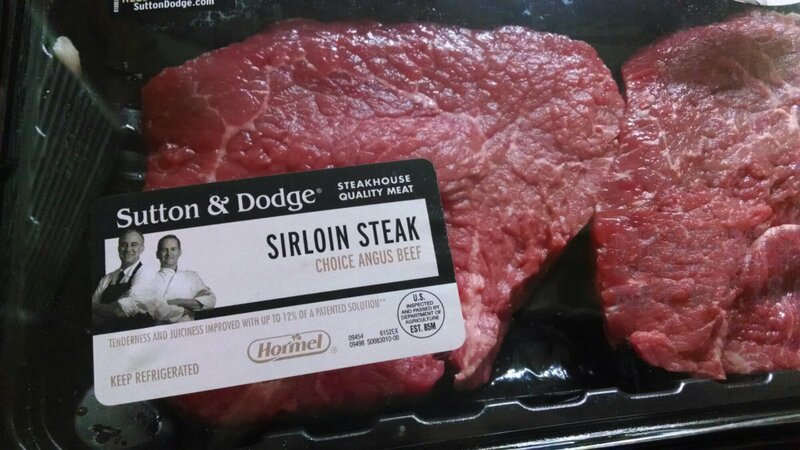 They sell steak from a meat company named Sutton and Dodge, and if you hadn’t noticed we share the same last name which for that reason and because it looked like a darn good steak, I had to try it! Let’s just say the sticker on the front that says “steak house quality” is not lying. They are now one of my go-to choices when I want to fry up a steak at home. Now on to the salad… It feels like a bit of an indulgence, but it’s actually good for you as well. 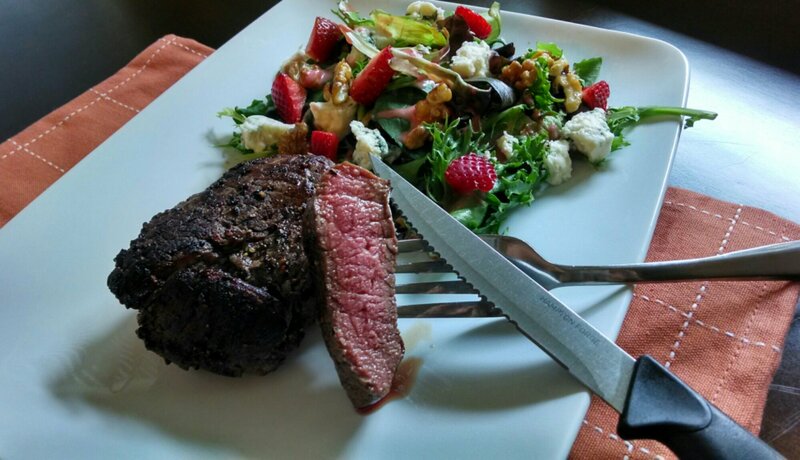 I dressed up the walnuts with fresh honey to give sweetness that I balanced out with salty blue cheese, then topped it with strawberry vinaigrette made from fresh strawberries, threw on some more fresh strawberries; and, boy was it good! 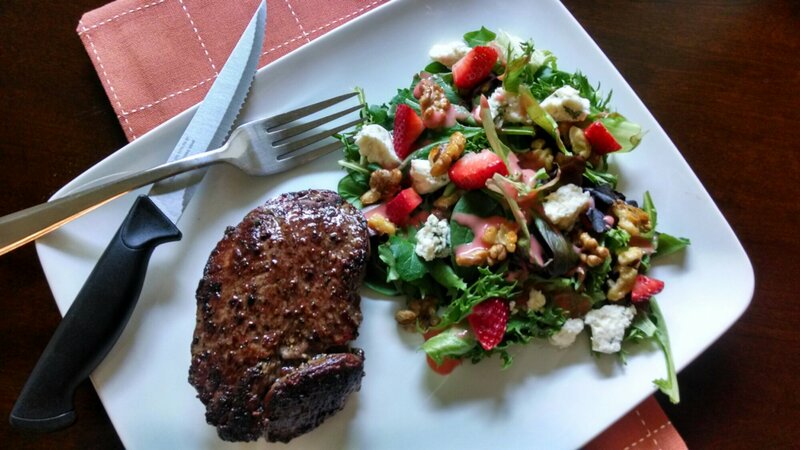 Top a bed of greens with blue cheese, honey roasted walnuts, and strawberries. Then drizzle vinaigrette on top. Add strawberries to a blender and puree until smooth. Then add honey, vinegar, salt, and pepper. Then set your blender to “mix” mode and blend while slowly adding the oil. Adjust any ingredients to your taste. Chill in fridge while cooking your steak. Roast walnuts in 400° oven for one minute. Remove and mix with honey and salt. Roast for one to two more minutes. Careful not to burn. Pre-heat oven to 400°. Then heat heavy duty skillet on med high to high heat. Season steaks with salt and pepper liberally for good flavor. Add oil and heat just until starting to smoke, then add steak. Your pan must be very hot and you should hear the sizzle! If not, remove steak and try again. Cook steak for 3 minutes on each side until a nice crust has formed. This is where you create all your flavor. Then put steak in preheated oven and cook for about 6 minutes more or until meat thermometer reads 145° for medium rare, or cook to your preference. It’s time to deck the halls… And our food blogs with holiday treats! 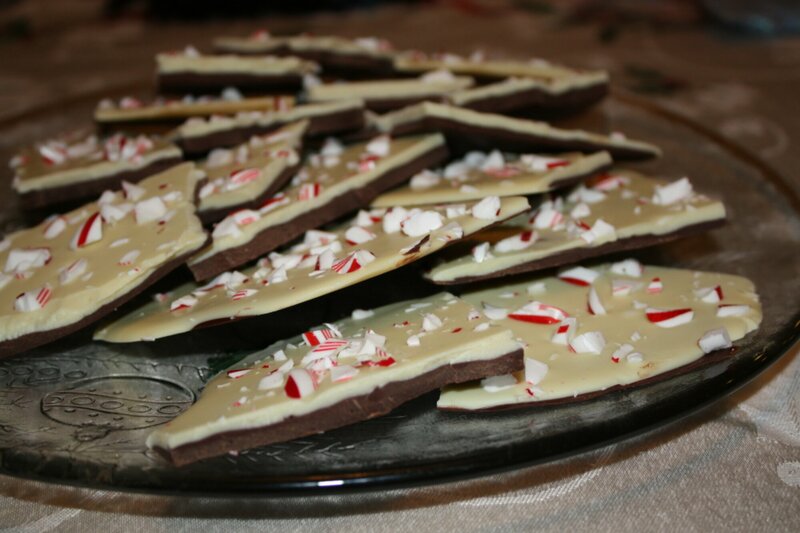 This one came as a request from my parents, it is their absolute favorite candy to eat during Christmas time. Good thing is, it is super easy to make and also quite fun! Start by melting the milk chocolate in a glass bowl sitting over a pot of gently boiling water. Once melted, add the peppermint extract and stir. Take off heat and pour onto a baking sheet lined with parchment paper. Spread evenly to desired thickness and let sit in fridge until hardened. In the meantime, melt the white chocolate in the same manner. Once the milk chocolate has hardened, pour the white chocolate over and spread evenly over top the milk chocolate. 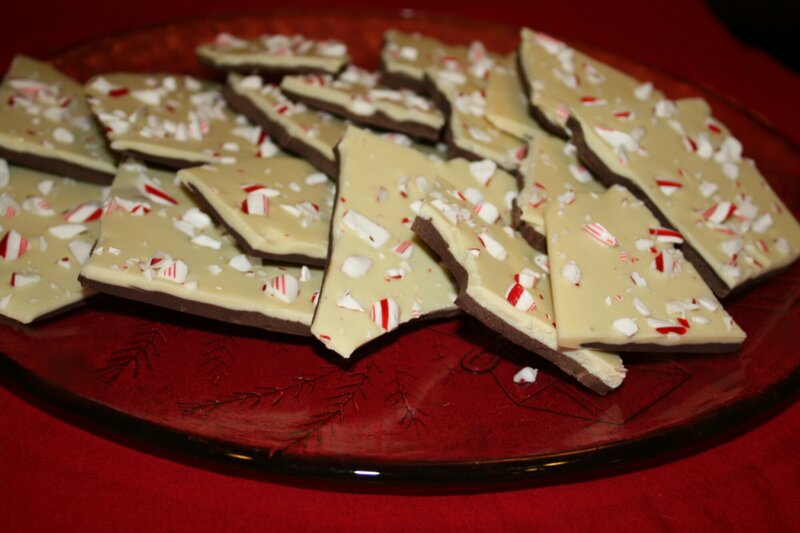 Crush candy canes and sprinkle over white chocolate while it is still melted. The chocolate should be pretty well covered with the candy. I like to break the candy into fine pieces. Put the baking sheet back in fridge until the chocolate has hardened completely. Once this is done, remove from fridge and break the candy into pieces sized to your preference. They should not be perfect cuts. I have a recent obsession, (not soup, that’s a life long love of mine) it’s Shabu Shabu. For anyone who is unfamiliar, Shabu Shabu is served at Japanese restaurants, and it consists of thinly sliced meat and fresh vegetables that is cooked in boiling broth and served with different sauces; at restaurants it is do it yourself. Fortunately for me, there is a fantastic restaurant for Shabu Shabu, Itchikawa, near my home that has the most amazing broth I have ever had! Pork bone. Its so rich and meaty (also a little fatty 😉 )… Oh so good! So I started taking the left over broth home to cook with, and just as I expected, it makes for an amazing additive. 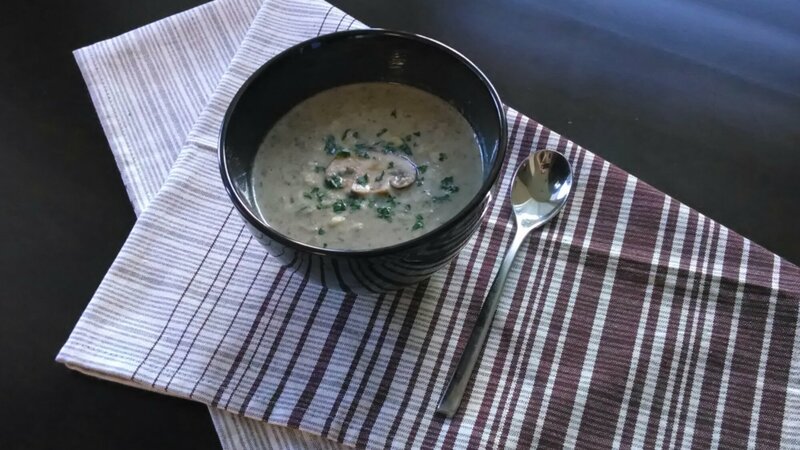 Today, I made my Creamy Mushroom Soup with pork bone broth in place of chicken stock. Of course, any stock will do just fine, chicken or vegetable for a vegetarian version. I paired it with a seared pork chop. And well, I live in Southern California, so it’s not exactly cold yet… But nonetheless, it made a pretty darn good fall dinner! Simple really… In a big pot or dutch oven: saute onions and leeks for a few minutes before adding mushrooms and thyme and sauteing for about 7 more minutes. Don’t forget to season with salt and pepper during this. Add garlic, cook for about two more minutes. Then add stock or broth and simmer for about 15-20 minutes. At this point, check seasoning. Transfer about 3/4 of the veges to a blender and puree until smooth, add back to pot . Add heavy cream and heat through. Serve and garnish with parsley and cheese if desired. © Priscilla Sutton and HotBites.WordPress.com, 2013. Unauthorized use and/or duplication of this material without express and written permission from this blog’s author and/or owner is strictly prohibited. Excerpts and links may be used, provided that full and clear credit is given to Priscilla Sutton and HotBites.wordpress.com with appropriate and specific direction to the original content. One of the things I love about cooking is we’re able to make a dish our own by having it fit our taste. Like taking a classic and whipping it up the way we want. 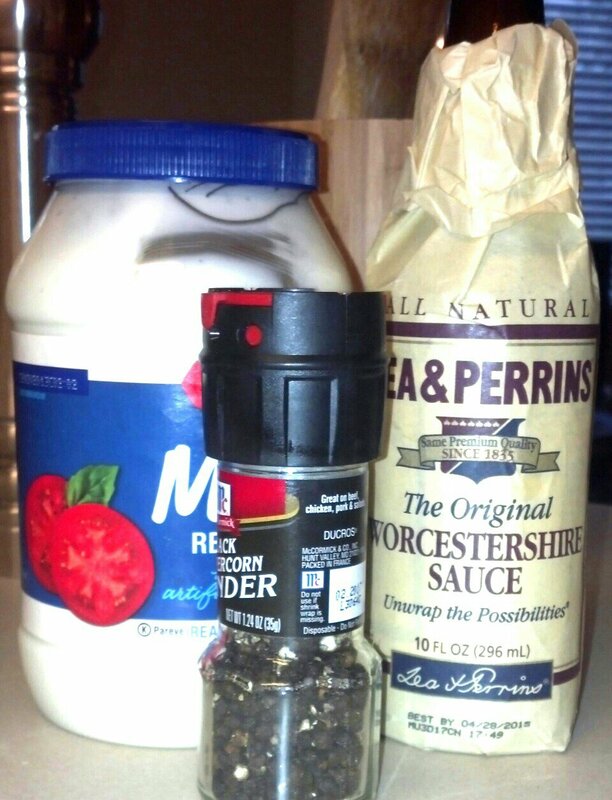 Add one ingredient or nix another, we play by our own rules in the kitchen! There is usually some trial and error involved… Sometimes we score and other times perhaps it would have been best to leave it well alone. But either way, it is fun right?! This is one of my versions of a familiar dish, Chicken Piccata, which basically translates to breaded sauteed chicken in a sauce. I kept mainly to the tradition but did leave out the white wine, simply because I had none; and, to my preference, used an abundance of regular yellow onions instead of shallots. However, on other occasions I do use the ingredients I just mentioned, so don’t think I’m ruling them out! Start out by seasoning the chicken well with salt and black pepper. Then dip into flour to lightly coat, shake excess flour off. Add to a skillet with oil heated to medium heat. Cook about 5 minutes on both sides or until golden brown on both sides and cooked through. Juices will run clear when done. Remove chicken from skillet and set in warm place. Add onions to skillet, sprinkle with salt and pepper and allow to cook for about 7 min, or until soft. Then add garlic and cook for 1-2 minutes more being careful not to burn. Add chicken stock and simmer for about ten minutes until the liquid has reduced by more than half. Once reduced add lemon juice and turn heat to low. Allow sauce to cool down and then add heavy cream. If stock is too hot, when added, the cream will separate. Season sauce to taste. 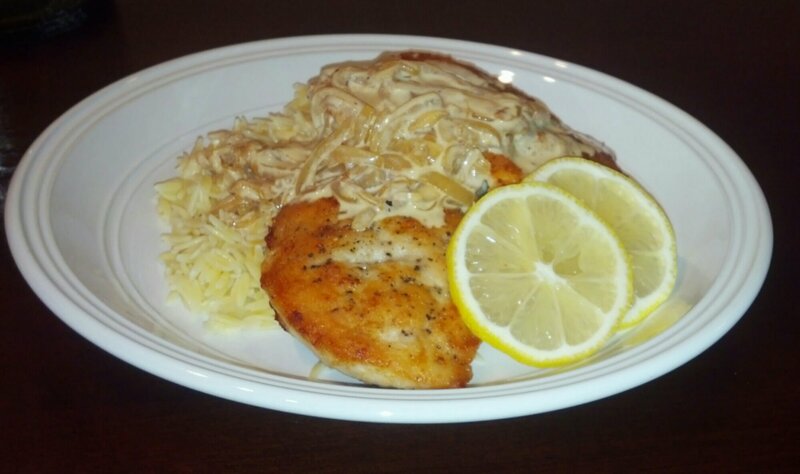 Plate chicken and cooked Orzo and top with sauce. Enjoy! My husband ate a burger while in Las Vegas some time ago and came home to tell me how amazing it was and that he must take me there to try it. So yesterday, remembering some of the ingredients he mentioned, I decided to make a similar burger and see if he would connect the dots. I did not, however, try to replicate it. I was sneaky and never mentioned the burger he loved from Vegas, but after he took the first bite and immediately said “heey!” I knew I did good!! He was very pleased… it was pretty awesome. Heat oil and butter on med low heat. Add onions and cook for 30 min until caramelized, season with salt and pepper. Saute in skillet for about 7-9 min on medium heat. Cut kaiser rolls and butter insides of both pieces, grill until golden brown. Season with salt and pepper then fry burgers in skillet on med high heat on both sides until barely pink in middle. After the first flip, add 2 slices of swiss cheese to each patty and allow to melt completely. Pile all ingredients on bun, including sliced tomato, and dig in! 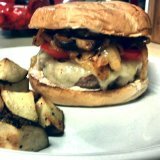 I served burger with oven roasted potatoes. Toss cut potatoes in olive oil, salt, pepper, and seasoning salt. Roast at 400° for about 30 min, or until golden and crispy. Serve with ketchup. It hasn’t quite felt like summer to me until this week when I have been spending most all my free time in the pool and next to the grill. My daughter likes hot dogs, so needless to say I have grilled many of them, but tonight it was all about the chicken! My inspiration for this dish came from Anne Burrell’s Garlic Chicken Casserole with Israeli Cous Cous. 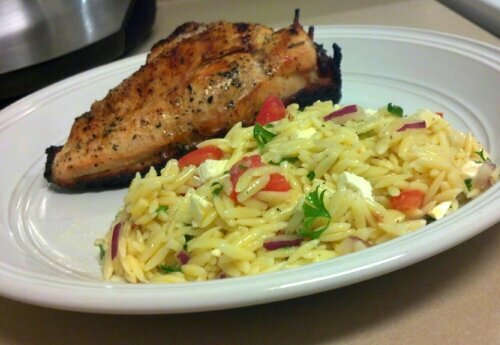 Its basically a variation of that using almost the exact same chicken recipe, but I paired it with my cold Orzo salad instead that’s zesty and simple to make, which I think is great for a summer night. I changed the increments of the chicken marinade a bit. Then I used rosemary instead of thyme and ground cumin instead of toasted cumin seeds as Anne Burrell used, only because that is what I had on hand. To make marinade I added the peeled roasted garlic, cumin, rosemary, lemon juice, and lemon zest into the food processor and pulsed while adding the olive oil until well blended. Then I poured the marinade on top of the chicken in a zipper lock bag and let marinade for 3 hours. Before putting the chicken on grill I sprinkled it with salt and pepper and grilled it on medium-low heat, about 10 minutes each side. Cooking time might vary depending on what part of the chicken is being cooked, breasts cook for less time. To make Orzo salad, I added the orzo to a pot of seasoned (liberally with salt) water and let boil for 9 minutes. Once done I rinsed with cold water and allowed it to cool completely. For the vinaigrette I mixed the lemon juice, zest, garlic, salt and pepper together; and then whisked in the olive oil. I add the remaining ingredients to the Orzo and then mix with vinaigrette. It needed a bit more salt so I adjusted the seasonings once done. I really enjoyed this; it is a great summer dinner. It seems I can never get enough pasta lately! 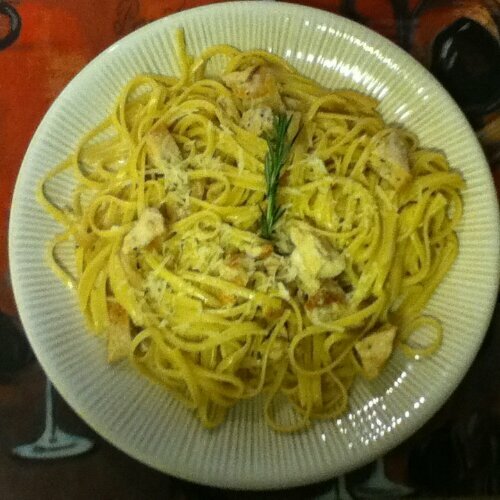 I created this recipe one day when my pantry and fridge were running low on food, so I pulled out the ingredients I had and ended up with one of my favorite pasta dishes. That week I probably made it for lunch two more times. 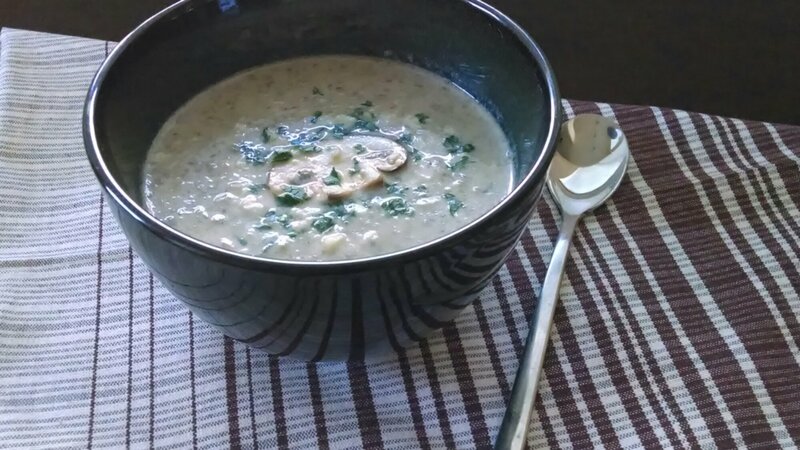 There are so many flavors going on in this dish, it’s creamy and fresh tasting from the lemon, and there’s a hint of rosemary to compliment the meatiness of the chicken and stock. Boil water and prepare chicken: heat olive oil in skillet on med-high heat, season chicken liberally on both sides with salt and freshly ground black pepper. Add to hot skillet and cook through and until golden brown, about 2-3 min each side. Remove chicken and set aside. Season boiling water liberally with salt and then add linguine, cook until al dente about 9 min. Add onions into same skillet; cook until fragrant, about two minutes. Add garlic and a pinch of salt, cook, stir occasionally, about 2 min. Add chicken stock and whole rosemary sprig and bring to boil; once the stock is at a boil and the rosemary is fragrant, remove it from the stock; stock should reduce in volume by half or more. Cut chicken into small pieces, do not add yet. Add lemon juice and black pepper to taste (add salt if needed). Turn heat to low and allow to cool for a couple minutes, then add heavy cream (if stock is too hot the cream will seperate). Stir and add chicken to sauce. Check seasoning, add salt and pepper if needed. Add linguine straight to pan and before stirring add parmesan cheese, then mix well. Transfer to serving dish and garnish with some of the parmesan cheese.